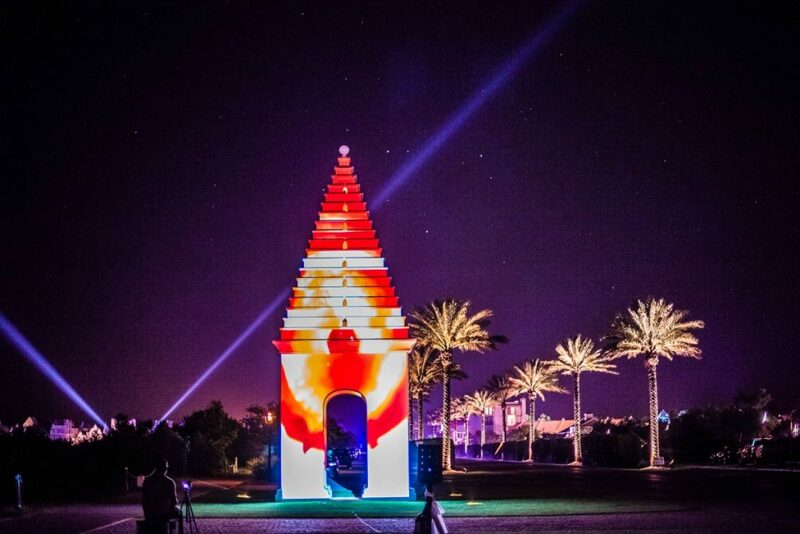 Digital Graffiti is set to light up Alys Beach for the 11th year in a row, May 18th through May 20th, 2018. We’re all intrigued by the lights, colors, and movement brought each year to the stark white structures indicative of Alys Beach. On Friday and Saturday nights during the festival, video, digital, and graphic artists project their work onto homes and other buildings throughout the town. As a viewer, you casually move down cobblestone streets from one exhibit to the next. The event concludes at Caliza Pool, leaving you awash in inspiration and admiration. Digital Graffiti attracts all types of media artists from all over the globe, which is what makes the festival especially exciting for South Walton. No one knows the festival better than Event Curator Brett Phares, who recently illuminated us by sharing his process for finding artists to showcase at the event. With an extensive background in art and technology, it’s no wonder Brett was chosen 11 years ago to assist in the creation of Digital Graffiti. Learning from the surroundings and his experience each year, Brett makes adjustments, improving the overall experience and treating repeat guests to a unique experience year after year. Artists can submit their work through the Digital Graffiti website. Brett reviews each entry and chooses art that he knows will work well in the elements. Once the artists are chosen, he looks at the function of each piece and decides where it will best fit. Since there are no blank spaces, the work must make sense with the surrounding elements, such as gas lanterns, shutters, fountains, foliage, pools, and so forth. The town of Alys Beach is the ultimate canvas for any artist, providing large white walls and expansive spaces necessary for projecting art at a large scale. There are times when Brett will decide to project an artists’s work over something specific, such as gas lanterns, which changes the art dramatically. He tells us it’s all part of this very unique process. Katina Bitsicas, one of the artists presenting at Digital Graffiti this year, shares that she draws from her personal and environmental experience, creating artwork influenced by the human psyche. This year, Katina is displaying a piece entitled, “Wavelength,” which is inspired by the beaches of 30A. She says that the piece will allow viewers, “to explore our limitless oceans, and mysteries about what lies beneath the surface.” Her exhibit aims to transport the beautiful waters of Alys Beach to the white walls of the town. Don’t miss this installment at the 2018 Digital Graffiti event. Tickets are available online, and we encourage you to get yours now!